Which security system is right for your home or business? There are a lot of elements that go into designing an optimal home automation and alarm security system. Thankfully, our experienced and highly-trained security professionals can explain your options based on your needs. Here are a few to consider as you determine what those security needs really are. Communication of your alarm panel is one of the most important elements to consider when designing a reliable security system. By design a burglar alarm panel support POTS (Plain Old Telephone Service) line communication, but not everyone has those now. Not to mention that an analog system can be accessed from the outside and can be disabled easily. Though many people in Houston, and around the globe, have abandoned “landlines” for digital lines, these are not as reliable for an alarm panel either. So, what is the best option? At Megasystems Security, we offer cellular communicators to support various alarm panels. This is a much more reliable option and ensures that communication is uninterrupted to the monitoring station within your alarm and home automation system. At Megasystems, we know that the main job of any security system will always be to protect and monitor the perimeter! Door and Window contacts are your first line of defense, and are a must-have, if you want to keep your home or business secure. The second layer of a good alarm system are the glass break sensors, which trigger upon the sound of breaking glass. Our technicians ensure sensors should are distributed according to the distance limitations that recommended by the manufacturer. The third layer of a top-notch Houston home automation system will be the motions sensors. Placement of sensors is determined by a skilled technician to get the most coverage; always locating them in areas that will trigger false alarms. At Megasystems we always offer our clients the latest emergency panic buttons, which are installed in a key area of the house. All our alarm panels include a panic button that is built into the keypad or touch panel. This is an extra layer of protection that provides piece of mind should an emergency arise. A Megasystems Security smart system provide optimal solutions to help monitor and protect your home, your assets, and most importantly, everyone in it. 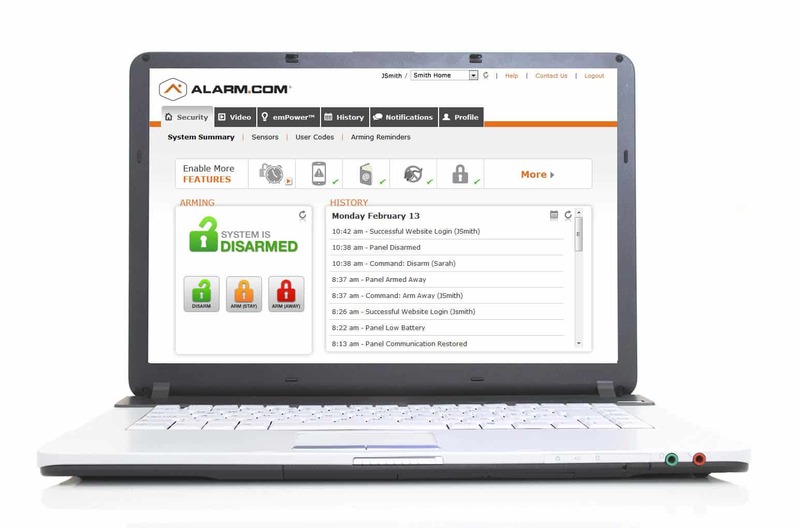 More than just a smart app, Alarm.com seamlessly connects the key systems in your home on one platform so they work intelligently together to keep you and your loved ones safe. Your security system will continue to work even if the security panel is damaged or the phone line is cut. Watch live feeds from your property right on your phone, tablet or computer. Watch from anywhere; it is simple! Get video clips sent directly to you when the front door opens, the alarm goes off, or if motion is detected. Never miss a thing with our easy to use searchable event history. Find the clips you need in a flash! • Protect what matters most. • Take control of your energy use. • Ensure wellness and peace of mind. • Instantly see what you care about. • Connect carbon monoxide and smoke detectors for proactive safety. • Have your home or work security system automated to meet your needs.